It’s easy to pop an over-the-counter painkiller when you suffer from a headache. If you find yourself reaching for the bottle of ibuprofen frequently or needing more than the maximum recommended daily dose, however, it’s time to get an evaluation with a trusted health-care professional. Dr. Scott Stewart and his team at South Lakewood Dental are ready to see Denver-area residents who suffer from chronic headaches and help them get the relief they need. You suffer from chronic headaches if you have headaches that last for four hours or more for at least half of the month for at least three months. There are many types of chronic headaches, but tension headaches are the most common, accounting for more than 90 percent of all headaches. Often, chronic severe tension headaches are misdiagnosed as migraines. While tension headaches present intense pressure – like someone has wrapped a band tightly around your head – migraine sufferers typically experience nausea and vomiting, and sensitivity to light. The causes of chronic headaches are difficult to pinpoint, but vehicle accidents (major or minor), sports injuries, trauma to head and neck, chronic postural positions (working at a desk or in a head forward position), hormonal fluctuations, problems with sleep, clenching or grinding…are all possible ‘background’ factors for chronic headaches and migraines. Most often there are more than one causal factors contributing to head pain. Chronic headaches can also frequently be linked to oral function. An imbalance in the bite frequently causes additional nerve pain that can trigger headaches/migraines. Teeth grinding, tension in your jaw and dental treatment may be contributing to your pain as well. If you believe you suffer from chronic headaches, set up a consultation with Dr. Stewart for an evaluation using his TruDenta technology. If the assessment shows a correlation between his proven Trudenta therapy and your chronic headpain, he can recommend in-office therapies such as ultrasound, microcurrent , laser, and bite force therapy that could keep you from having to continually reach for painkillers to seek relief. 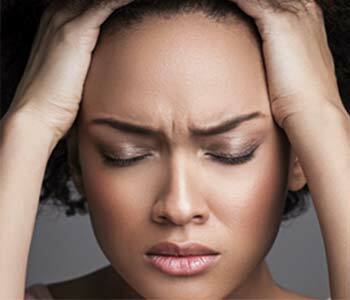 You are at risk of having chronic headaches if you are female and have anxiety, depression, sleep problems, are obese or have other chronic pain conditions. Frequent headaches also can lead to a lot of these same problems, so it’s important to get evaluated to find the cause, triggers and treatment that’s right for you.